Hail Damage Insurance Claim Lawyers | The Voss Law Firm, P.C. Hail is a common loss event for policyholders around the globe, and insurance companies pay out millions of dollars in hail claims every year. Unfortunately, the policyholders affected by hailstorms often have to fight to maximize their claims, get prompt resolution, and make sure their rights are protected. If you are struggling to resolve a hail insurance claim, or if you are concerned about an unfair denial or underpayment, you can reach out to the Voss Law Firm today at 1-888-614-7730 for easy-to-understand answers and experienced help with your claim. Was your home or business damaged during a recent hail storm? Is the insurance company trying to deny, delay or underpay your hail insurance claim? Our bad faith insurance claim lawyers know all the tricks of the insurance companies. Check out some of the questions we receive most often about hail insurance claim, or give us a call at 1-888-614-7730. QWhat Can I Do If the Insurance Company Refuses to Replace My Entire Roof After a Hailstorm? QIs My Farm Covered for Hail Damage? QWill the Insurance Company Cover Both Roof and Water Damage Caused by Hail? QHow Can My Business Maximize a Hail Insurance Claim? You may be thinking to yourself that you remember a hail storm but looked up at your roof and did not notice any damage. The fact of the matter is you can’t see hail storm roof damage from the ground. The truth is many home inspectors do not even know what to look for because they receive no formal training on hail damaged roofs. A home's roof must be physically inspected by a person who has training and experience to determine if there is actual hail damage. Insurance companies send their adjusters to special training so they can properly identify hail damage to a home. And, the insurance company is generally NOT ON YOUR SIDE. With hail damage, you will see some of the tiny granules of a roof missing. Over time the roof damage will get progressively worse and shorten its lifespan. Eventually, your roof will end up leaking. Even if your home or business' roof has minimal hail damage you have a valid insurance claim and should file with your insurance company. 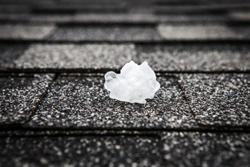 The damage caused by a hailstorm might not cause your roof to leak for years. This makes it critical to have someone who is qualified inspect your roof. In the streets leading up to a neighborhood where a hail storm just hit there were at least fifteen homes that had roofing contractor signs in the front yard. This has been big business for the roofing contractors in the past. In fact, if the damage was so widespread there might even be contractors from out of state getting into the fray. Out of state roofing companies are often known as “storm chasers”. It is not uncommon for homeowners in areas where damage has occurred to be offered a “free” roof. You may find that roofing companies call you or stuff your mailbox with their fliers looking for business. So what do you do if you think you may have hail damage to your roof and want to file an insurance claim? You should 1st check your home insurance policy and make sure you are covered. As long as you are, put in a call to your insurance agent. They will get a claim started on your behalf and ask an insurance adjuster to visit your home and look at the roof. At the same time, you will also be wanting to get in touch with a local roofing contractor to give you an estimate on replacement. You should actually have the roofing contractor/contractors visit 1st to verify you do in fact have hail damage. Often times the insurance adjuster is going to want to get together with the roofing contractor to make sure they are on the same page. The roofing contractor you are hiring should have no problem meeting the adjuster with you. The adjuster will take pictures of any damage and then explain what the next steps will be. Some adjusters may give you a settlement quote right on the spot while others may take up to a few weeks. The adjuster and roofing contractor are more than likely going to compare notes to see if the total roof measurements are about the same. If the insurance adjuster happens to think there wasn’t any significant damage you will need to have your contractor debate it with them. If you are not able to have your roofing contractor at the home when the adjuster can be there most insurance companies will agree to have the adjuster come back at a later date.You should also keep in mind that many insurance policies have some kind of deductible that you will need to pay. As with any other business it would be prudent to get references and make sure the roofing contractor is licensed and insured. The average costs of repairing a hail-damaged roof can run to a few hundred or a few thousand dollars for homeowners, depending on the damage and the roofing material. The cost of fully replacing a home’s roof averages about $6,000. For businesses, governmental policyholders, farms, and other kinds of properties, the costs can add up to significantly more due to the number of structures affected, the type of roofing, the size, etc. Hail often affects windows, which can run from $450 to $1,000 or more each for replacement, depending on the type of window. The costs of hail damage to a car can add up fast, averaging out to about $2,500. This can be costly enough for individuals, but it can be overwhelming for businesses and organizations that operate fleets of vehicles or must pay for damage to heavier work vehicles and equipment. Long delays in resolving a hail insurance claim. Only paying for surface damage while ignoring deeper damage that could cause problems over time. Ignoring damage to HVAC systems, windows, siding, and other non-roof damage. Denying that hail caused your damage. Lack of communication from the insurance company. Underpayments based on inaccurate or rushed estimates. Coverage surprises and disputes over policy language. You can learn more about hailstorms—and the potential insurance issues that follow—by visiting our quick guide to hailstorms. Fortunately, although many policyholders are unaware that they have rights after a denial or underpayment, our hail damage insurance claim lawyers have many years of experience helping people and companies maximize and resolve their insurance claims and fight unfair treatment. If you have questions, you can give us a call at 1-888-614-7730. A claim is unfairly denied. There are mysterious delays in resolving your claim. You “hit a wall” in your negotiations with the insurance company. You can’t agree with the insurance company on what settlement should be. You feel you aren’t being treated fairly or your rights have been violated. The hail damage insurance claim lawyers at the Voss Law Firm have many years of experience fighting denied hail claims and other difficult cases on behalf policyholders across the nation, and we are proud of our history of success. If you need help, or if you have questions about a hail insurance claim that has been denied, delayed, or underpaid, don’t hesitate to reach out to us at 1-888-614-7730.